A lush, exclusive lodge nestled between the Timbavati Private Reserve to the north, Sabi Sand Reserve to the south, and open to the Greater Kruger National Park on its fenceless eastern boundary. 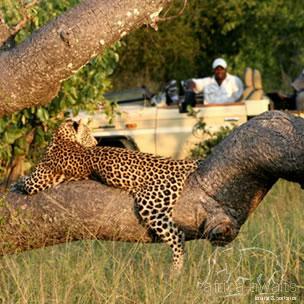 Tintswalo Safari suites and lodge are all situated along a seasonal river bed among an ancient sycamore tree grove. 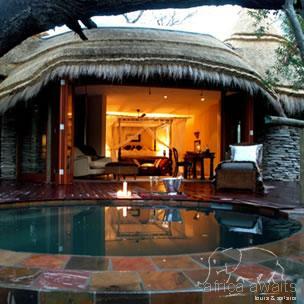 The exquisitely appointed main lodge overlooks a waterhole frequented by a large herd of elephant and other big game. The Explorer suites and Presidential are all linked to the main lodge by raised wooden walkways. The Tintswalo suites are authentically decorated to reflect the pioneering times of the nineteenth century African explorers. The air-conditioned suites are situated along the banks of the seasonal Nwaswitsontso River. Providing supreme comfort, privacy and an opportunity for effortless birding, as well as the chance to view a large variety of big game from the privacy of each unit. The indoor/outdoor shower leads off from the spacious bathroom which opens out onto the deck. Luxuriate in a private plunge pool or just relax on a lounger under the African Sun. Kingsley Suite – Mary Kingsley, a nineteenth century spinster, explored with humble resources collecting fish and insects samples for the Royal Geographic Society. An understated twin or double suite. Livingston Suite – The most widely known explorer of Africa’s colonial history. A twin or double luxury traveller suite. Burton Suite – Richard Burton, a controversial character donning a turban, historically he translated the Arabian Nights into English. A richly decorated twin or double suite. Speke Suite – John Hanning Speke, a true gentleman, also in search of the illusive source of the Nile. A spacious luxury suite with large four-poster. Stanley Suite – Originally a Welshman, Henry Morton Stanley was the man who found Livingston. A beautifully appointed double suite with a large sleigh bed. Baines Suite – Thomas Baines, an engineer and artist. This suite is part of the Presidential Suite and accommodates four guests, either as part of the main lodge or privately. Every suite has an extra length double or twin bed, en-suite bathroom, air conditioners, overhead fans mosquito nets, private deck with an intimate plunge pool overlooking a game-friendly river bed and magnificent Sycamore groves. The lodge has a small but exclusive library of rare books as well as a wine cellar from which wine can be chosen to enjoy with alfresco dining on the lodge deck, in the exquisite setting of the formal dining area, in the wine cellar or even under the stars in the African bush. The Vital Source Spa is privately situated at the lodge and has Internationally Trained Therapists awaiting guests, ready to ensure removal of the last vestiges of city stress from body and mind. The Spa specializes in hands-on treatment for both men and women utilizing Elemis and Africology Products to stimulate all the senses. With your holiday, safari or business trip from in to Tintswalo Safari Lodge in Kruger National Park.